Happy Monday everyone!! I hope you all had a wonderful weekend! 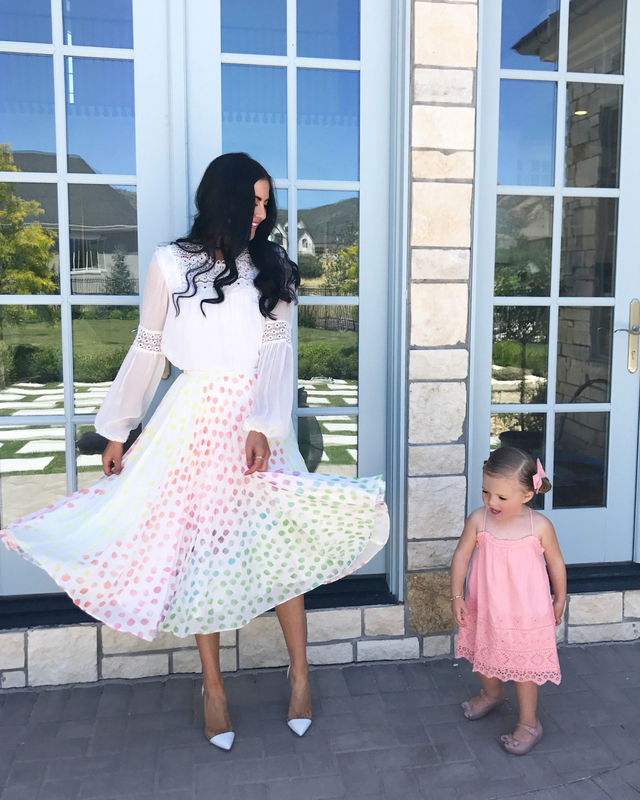 Yesterday to church I wore one of the newest Rachel Parcell arrivals that just hit my clothing line’s site and I got so many compliments!! This is a limited edition print that was actually a custom water color print we had designed right in our studio. It’s placed on our best selling accordion pleat skirt and it turned out more lovely than I had hoped! I think it’s my favorite print to date (and that’s saying a lot because I’m usually a floral print kind of girl). You can’t help but do a twirl when you’re wearing this skirt! Below I have it paired with a bloused for a more dressy feel and in the photos above I’ve style it with a basic tee and pink accessories! There are so many fun ways to play around with the styling of this skirt because you can pull out so many different colors. I love the peachy pink color I pulled out of the skirt to match with little Isla Rose (oh and she was a major fan of the skirt too, she kept saying “mama pretty!”). Wow that skirt is absolutely gorgeous. Love all the fun colored polka dots on it. You’re looking absolutely stunning in this outfit! LOVE your chic skirt! Isla Rose looks adorable in her outfit and I love the print of your skirt. Such a gorgeous look! I love the skirt so much. Thanks Gemma! Glad you like it! What a fun skirt! I love the subtle pop of color! Rachel, is the hem of this skirt somewhat hi-lo? It looks longer on one side than the other. Thanks Caroline! It’s Rebecca Taylor! That skirt is gorgeous!! I love the watercolor polka dots! This skirt is gorgeous!! I love the watercolor polka dots! this look is so much fun! I love it. What a beautiful skirt, Rach; you did a great job designing it’s so fun and playful, perfect for summer! You also couldn’t have chosen a better backdrop to your photos, too, the flowers looks so beautiful gracing you! Thanks for sharing and I hope you have a great week ahead! This skirt is so cute! Love how you paired it with a casual white tee! This is such a beautiful skirt and perfect for summer!! Love this cute skirt! The colorful dots make for such a happy addition to my wardrobe! I LOVE this skirt so much! Your entire line is super cute! That skirt is so pretty and perfect for the summer! This skirt is SO pretty! I’m definitely a floral kind of girl too, but this print is just darling. What a fun and feminine skirt! Isla is so precious in that photo! That is incredible that you came up with the print in studio and put it onto such a beautiful skirt. The custom water colour print is so gorgeous! I love the array of colors- it’s very playful and feminine. I’m a big fan of pairing dressy skirts with plain white tees. Great creative design, Rach! Thank you so much, Janina! It means a lot! What a fun look! Perfect for the summer! That skirt is beautiful. I love how it subtly colorful. And your daughter’s comment – so cute! Such a pretty skirt! I love how it matches the flowers in the background!! Such a cute and beautiufl outfit! And btw. your skirt is gorgeous! How amazing is that skirt? It is so pretty! You are so sweet!! Glad you like it! Love the colors and so cool that is a watercolor! Wow, such a beautiful and fun skirt…perfect for summer! Very pretty! Love the print on this skirt! That skirt is so gorgeous and in such a fun print! This skirt is absolutely BEAUTIFUL! The fabric, the flow…I can’t get over it! I’m obsessed!! Such a cute skirt! I’m loving the bright colors! Such a cute look. The skirt is gorgeous.